The waters off Dana Point on Tuesday were the scene of what one boater described as a dolphin funeral procession. The macabre episode revealed that not every mammal sighting is a cause for celebration, and that dolphins, like people, experience the loss of young and deal with that loss in ways that are both sad and touching. The footage was provided by Capt. 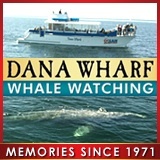 Dave's Dolphin and Whale Watching Safari (above) and Dana Wharf Whale Watch (below). "I believe this calf has been dead for many days, possibly weeks," Capt. David Anderson states in his video description. "You can see the flesh is decaying. In my nearly twenty years on the water whale watching I have never seen this behavior. Nor have I ever seen anything quite as moving as this mother who refuses to let go of her poor calf." Said Tony Green, a passenger aboard the Dolphin and Whale Watching Safari vessel: "The last thing I expected to see today was a funeral procession and it was a pretty profound statement about the emotions that those animals feel and how much … alike we are." Es muy conmovedor ver como estas criaturas pueden sentir y expresar una gama de sentimientos, que se podría creer son propios de los humanos. Esperaría en Dios que aquellas personas que matan a estos animales, adquirieran conciencia de su valor como seres especiales, y que tienen similitudes con las criaturas humanas en sus rasgos más nobles. Many years ago at the mouth of Spruce Creek in Port Orange Florida my mother and father witnessed the still-birth of a dolphin. For over an hour the mother dolphin continued to push the still born baby to the surface for air before finally abandoning it.